I'm Sean, one of the many new faces floating around the gallery. In contrast to all the chaos that is downtown, it's been a fairly quite day. What better way to start a new chapter than to sit and watch Dennis Lin's n° 1-60 sway in the wind? Today's my first day in the gallery and it's the first chance I've had to really interact with, and appreciate the work on a more personal level. So far the experience has been completely welcoming and fresh! I look forward to many more beautiful summer days to come and enjoying the awesome breeze in the ally! Stop by and check out the installation, or just pop-in and say hi! Here's a little cross promotion for one of our artists. Philippe Blanchard (who created the trippy animated installation Quest for Fire from last months show Ancestral Visions) is curating a screening of animated films this Saturday at 8pm at Xpace. 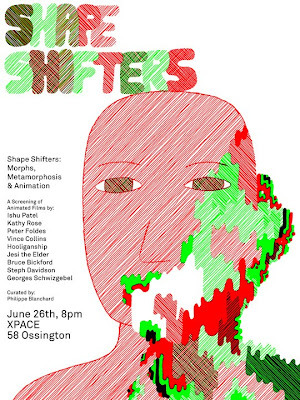 If you loved Quest for Fire (and I know you did), go see Shapeshifters. And don't forget to stop by 47 on your way there. We're open 'til 7pm. R.M. Vaughan talks about his experience with no. 1-60 in his July 19th Article in the Globe and Mail, if you happened to miss the paper copy take a read online! I've heard so many reactions to the current exhibition, no. 1-60. Some people are struck by the mortality evoked by the piece; others its testament to the life of the tree. 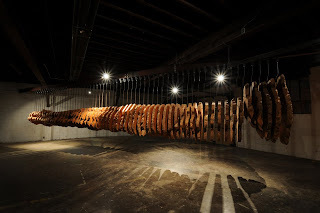 Formally, it has been compared to a hanging carcass, a dinosaur skeleton and an undersea creature (my first thought was a petrified shish kabob - probably the least eloquent of the lot). That said, a question has occurred to me: if a completely different piece of art elicited the same types of associations, but was totally different in its materiality, would it be essentially the same piece of art? (...the same 'perfect form' zipped into two different materials?) Or does the art exist primarily in the material itself, thereby nullifying the question? Today is my first full day minding the gallery from open to close, it is also my first day living with the work of Dennis Lin, n° 1 - 60 which runs till July 30th. "It looks just like an undersea creature! That's why I like it so much! It's like a big monster!" I smiled and agreed with him, it reminds me of that too and yes, that is one of the many reasons why it is wonderful. He left without reading anything about the artist or piece, excited by what he found one cloudy Sunday afternoon. I like that his reaction made me look at the work again, with fresh eyes (even though the morning had only passed by). I'm sure this could be said of any interaction one has with another viewer in a gallery, but these reminders arrive in a timely fashion, so I'm sure I needed it. The surprise and delight this man expressed was contagious. When he left I got up and walked around the piece again, taking it in. I think it's easy to become a little jaded to the magic that can be evoked by the unexpected. It perhaps takes a shared experience with someone else to re-open our eyes and look again, more closely. Come in and share what you think about the work sometime soon. At this moment, there is a thirty-foot salvaged Chinese junk in Trinity Bellwoods park, with a meticulously detailed interior that deals with the theme of aimless wandering. I love it when art goes far enough to actually create an ulterior world, instead of just suggesting it. Reminds me of Luke Painter's model house that was in Gallery 47 last month. I think the reason I enjoy immersive art is that it makes me feel like a little kid again. When you are young, everything is so much bigger, and nothing has lost its novelty. As an adult, no matter what size something is, as long as the proportions are 'normal' it generally escapes notice. But making a house that is too large to be a doll house and too small to live in, or plunking a ship in the middle of a city park brings back that old toddler feeling all over again. And that is why art is so very important: it keeps things in perspective. If a tree falls in the forest, I want to hear it.. When I think of the materials I usually live with - white paper, plastic on electronics, faux wood flooring.. I realize now that I never pay attention to any of these. They are reduced so as to avoid giving any indication of themselves. The blurred out frames that I pass through. I think this unconsciously makes people tired; always looking past the place and substance they are currently in. But now there is a Jurassic-sized dissected maple tree hanging in front of me. Evidence of growth, possession (by termites), deterioration, quiet grandeur in old age: like the phases of a human life. On one side are knobby, pointed growths. Traces of blue and white chalk from the mill. I would like to know how old the tree is, give it a birthday. (I would like to know how old my faux wooden floor is, now, too. Imagine knowing that information about all the nameless matter you used in a day...). I'm looking forward to living with this piece for while.